This a hydrogen /oxygen generation plate cell arrangement that Graham Snook from the energy 21 newsgroup has constucted and I believe it has been constructed as thus. 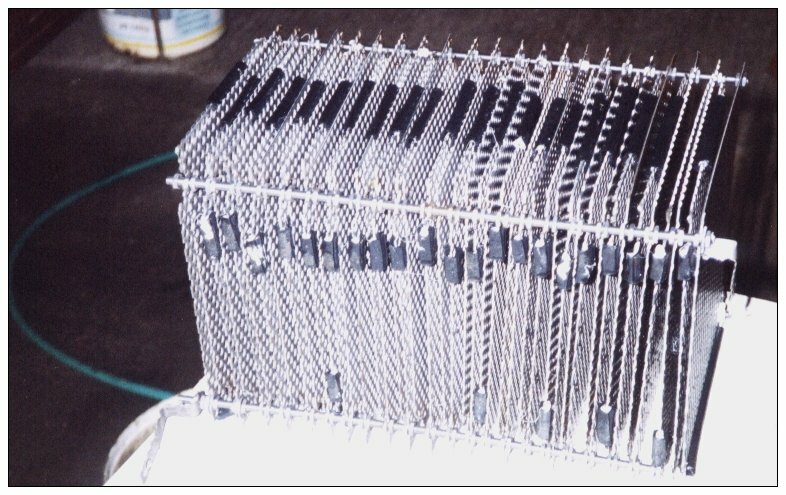 From the photo it has either 22 or 44 stainless steel mesh plates ,I think the later is mostly likely. I assume the current is supplied to plates by means of the supporting frame so that the plates as in this arrangement positive ,negative,positive ,and so on. I think George Wiseman is perhaps using a similar design construction in his Brown gas generator devices,but they may have more or less plates. I believe the current is supplied to the plates is fed through the support frame. but not confirmed by Graham please refer to diagram below. If current is fed through the support frame, one plate would be in electrical contact with the positive support rail, whilst on the opposite side it is insulated from the other negative supply rail and the bottom rails insulated from the bottom of the stainless steel plastic or the supports could be made made of a non conducting material. The next plate would be in electrical contact with the negative support rail, whilst on the opposite side it would be insulated from the other positive supply rail and so on. It also seems that Graham has used spacers on two sides at least to keep the plates apart and I suspect they are on all four sides. These spacers appear to be plastic tubing cut lengthwise and placed over the stainless steelplate edges. To produce gas this whole arragement would need to be submerged in water into a suitable container so that any gas produced would be collected into a vessel and sealed so that any gas produced would not escape into the surrounding atmosphere. I am not sure what voltage or current values he is using or what gas output he has achieved. When Graham sends me some additional information in addition to what is here,I will place this here also for those that are interested. The following is what Graham has sent me. The water car is not up and running properly yet, I have had problems with the electronics and when you have not got government backing and lot of money to throw at it, it becomes hard but I have had good results and it should be going about in a month hopefully. The cell in the photo is one of my prototypes but this worked well but did not make enough hydrogen. I will give you a quick insight how the water car is going to work. The car starts on petrol after 1200 RPM it goes on to hydrogen made on demand. It might have a top speed of 80 MPH depending on the size of engine but this can be worked on as I deepen my expertise on the in's and outs of hydrogen production, after all it's all new to most of us anyway. So the car starts on petrol and after 1200 RPM goes onto the Hydrogen/Oxygen which is made on demand, you have a 3 way switch in the car centre position AUTO left petrol right, Hydrogen Oxygen all the time if you wish. But leave it on AUTO why you might ask? Well here's why when you come to a stop, switch over and you are on petrol and it then burns all vapour left in the cylinders and when you leave you car it will not rust out. that's about it. Until I can give you all information plans photos for people to have there own water car it will work on diesel but that's the next step.